I recently came upon this site, which was created last year at first “as a way to show the magnitude of the BP Oil Spill. Through a number of conversations with visitors to the site, we realized that we had stumbled onto a very powerful concept. Representing large facts in relation to a person’s own home is much more revealing than a simpler presentation of facts. From this understanding, the new IfItWereMyHome.com was born. 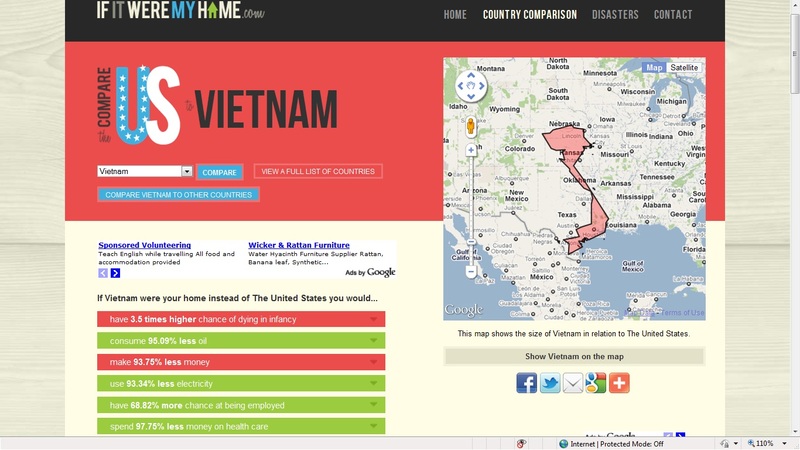 The site acts as a gateway to understanding the world around you.” It does this not by merely comparing facts and figures but by personalizing them (e.g., If Vietnam were your home instead of The United States, you would be 16.67% less likely to have HIV/AIDS). It reminds me of a photo essay book entitled Material World: A Global Family Portrait that compared living standards of people in many countries. Published in commemoration of the United Nations-sponsored International Year of the Family in 1994, it contained portraits of 30 statistically average families with all of their worldly possessions displayed outside their homes, as well as sidebars offering statistics and a brief history for each country and personal notes from the photographers about their experiences. 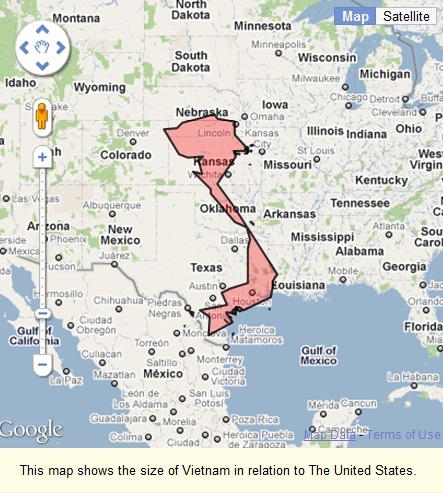 The site features a comparison of the United States with virtually every country in the world, a superimposition of those countries on a map of the U.S., some basic facts about both countries in predetermined categories, a one-paragraph country overview, recommended readings, and a comments section. Each country profile ends with the question “Would you rather live in _____ (INSERT COUNTRY NAME)? The map superimposition brings into sharp relief just how small Vietnam is geographically compared to the U.S. It is just a big larger than New Mexico, would take up about half of Texas (population 28% that of Vietnam), and would easily fit into California. This also highlights related issues such as population density (Vietnam: 90 million) and sustainable development. The following facts and figures are presented using CIA World Factbook information with the exception of the item about health care (i.e., World Health Organization). It would be great if the site included information about other important issues (about which reliable information could be obtained), including population, population density, economic growth, inflation, poverty rate, education, corruption, Internet use, media, military expenditures, etc. It would be helpful to have information that places these facts and figures in some kind of societal and historical context, and enables visitors to connect more of the dots. Why do Vietnamese “have 3.5 times higher chance of dying in infancy” and “consume 95.09% less oil”? Or, why does the US consume such a large share of the world’s natural resources? (US Americans constitute 5% of the world’s population but consume 24% of the world’s energy.) Perhaps that’s another website. Answers to these questions are also provided in the recommended readings. In the case of Vietnam, the reasons are many and varied, including war and its legacy, an economic embargo that ended in 1994, poverty, isolation, mismanagement, corruption, reform, economic growth, foreign direct investment, tax policy, and globalization, among others. At any rate, the website does an excellent job of driving home the point that “the lottery of birth is responsible for much of who we are. If you were not born in the country you were, what would your life be like?” Country information without comparison and context is not very meaningful.